This is the ramp leading down to the tunnel of the bus station of Mülheim’s central station. I actually called it the post tunnel because it is located right next to the main postoffice, which is just to the left of this photo. 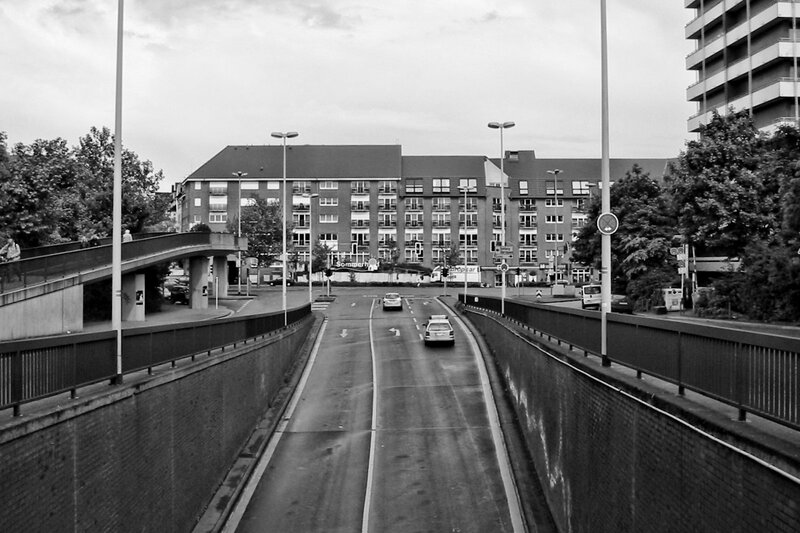 The buildings you see in the background are a retirement home complex called the Sonnenhof which was built in the early 1990s together with the pedestrian bridge spanning the Tourainer Ring. On the right is one of the ever-present highrise buildings, and just right behind me is the shopping center. I discovered this shot from May 2003 when I was going through the old photos and loved all the angles and lines in this perspective.